How Do I Know if I Have a Hip Impingement? A hip impingement is a pinching that occurs at the head-neck junction in the hip socket. 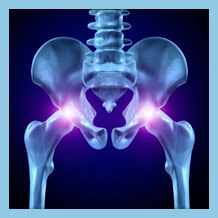 Signs and symptoms will begin with a subtle decrease in ease of motion to the affected hip. Shortly after patients will begin to have localized pain. As the condition persists, the pain will be felt during sudden lateral movements or extending activities that require hip rotation or movement. Some patients also describe a locking of the hip at the area of discomfort. A physical exam by a doctor will reveal pain with rotation and guarded motion compared to the opposite hip and an x-ray will further confirm a diagnosis. Do you have any of these symptoms and think you may be suffering from a hip impingement? We have a quick and easy tool to help gather some information from you to help us determine what your problem is and get you on the road to recovery. Early diagnosis and treatment may delay further onset. Rest, avoiding activities that cause pain, strengthening of the core muscle that supports the hip, and anti-inflammatory medication is usually the first recommendations. Steroid injections also prove helpful. If conservative treatments are not adequate, hip arthroscopy should be considered. OLSS provides a wide range of treatment options and because our doctors are the most experienced and best trained in treating hip impingement, we are able to perform many advanced treatments other practices may not be able to offer. The real question is: What treatment is best to treat your hip pain? Use our Treatment Check tool to quickly get started in finding the right treatment for you.